Gaines, on Brains: Sleep studies: What's all that stuff they put on me?! 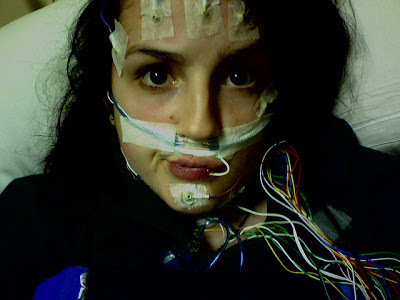 Sleep studies: What's all that stuff they put on me?! The following is a post written for the upcoming blog run by graduate students at Penn State College of Medicine. The blog will be aimed at high school students and residents of the community. I'll use these posts to introduce you to the research I'm conducting as a graduate student in neuroscience. 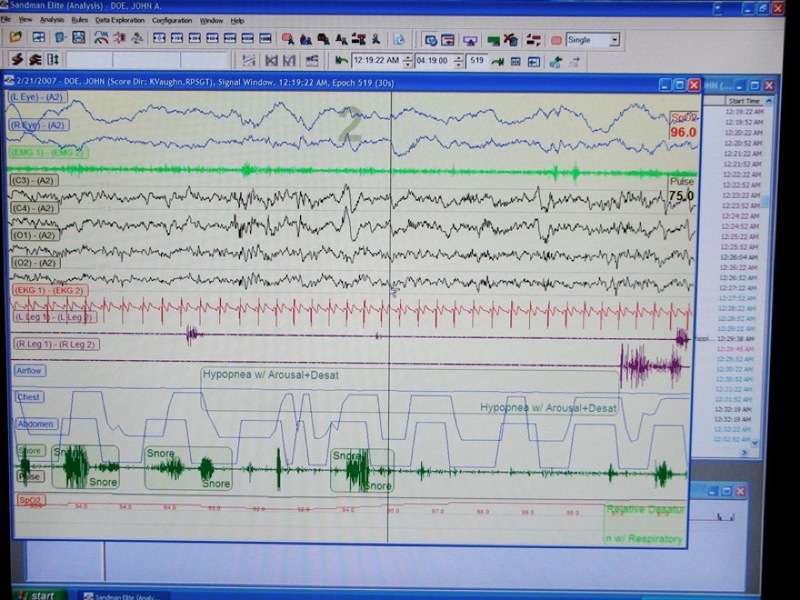 Have you ever had a sleep study done? Perhaps you or a loved one has been referred to a sleep clinic for insomnia, apnea, narcolepsy, or restless legs syndrome. Maybe you’ve participated in a sleep research study—and if you’re in central Pennsylvania, you may even be part of our laboratory’s adult or child general population cohorts! Looks rather scary, right? Fear not—each component has a very simple purpose. The snore mic is the first piece of equipment I’ll put on a participant. It’s simply a sensor I tape over the hollow of the participant’s throat that lets us know whether they’re snoring. This is interesting to note, especially for what our laboratory studies, because snoring may indicate obstructive sleep apnea—cessation of breathing due to some sort of blockage. Next, I’ll apply two sticky pads attached to wires (one on the chest and one on the lower rib). These electrodes are used in electrocardiography (EKG), allowing us to monitor heart rate and rhythm. I’ll then place two sticky electrodes on the shins, which will detect leg movement. In research studies, this helps us determine whether the participant wakes and moves around in the middle of the night (an “arousal”); in the clinic, uncontrollable leg movements may be indicative of restless legs syndrome (RLS). Two Velcro straps, called strain gauges, are then placed snuggly around the chest and abdomen. These monitor the rise and fall of the torso while breathing. Then comes the fun part: head electrodes! 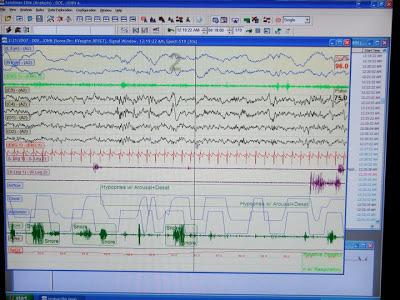 The principle behind electroencephalography (EEG) is to measure the brain’s “electrical activity”—a simple way of describing voltage fluctuations caused by ion flow in the brain’s nerve cells (neurons). To create a tight seal and promote conductance, I’ll first rub the scalp with an abrasive lotion, then scoop wax onto each electrode before placing them in precise locations. I’ll then cover the head in gauze to keep everything in place during sleep. I’ll then place a nasal cannula in the participant’s nose to measure airflow from both the nose and mouth. Studying one’s breathing using both the cannula and strain gauges is very important; if we see that the participant’s torso is rising and falling but there is no nasal airflow, this may indicate obstructive sleep apnea. Lastly, I place an oximeter on the participant’s finger just before they go to bed. This device uses infrared light to measure the level of oxygen in the blood. “Normal” levels are between 95-99% saturation; anything lower may indicate breathing abnormalities. But that’s a whole new can of worms for another day (or, perhaps, another blog post)! Oh, and one last thing—like Santa Claus, “we see you when you’re sleeping, we know when you’re awake…” There’s a camera on you all night, so we know when you pull out that pesky cannula…and we’ll wake you up to fix it!